TIW Technology, Easton, PA, has released Alere Manufacturing v9.5, which features the integration of Alere Data Acquisition. Alere Manufacturing comprises eight modules: Manager, Order, Route, Machine, Schedule, BOM, Plan and Cost. When installed internally to Alere Manufacturing, the new data-acquisition product provides operators with a streamlined system for issuing material to work orders. Accuracy is ensured as all scanning information is validated in real time. In addition to accommodating a variety of scanning devices, the functionality of Alere Data Acquisition is enhanced in that it also can be installed as an external executable program. • Internal e-mail system—Save time and effort by creating and sending e-mails directly from Alere, rather than using a standard e-mail program. • Update bill-of-material (BOM) revisions—Easily and accurately update work-order material lists based on new or past revisions of the BOM. 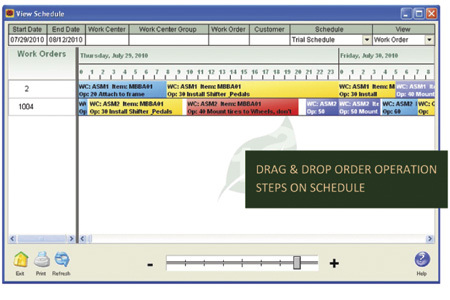 • Drag and drop schedule board—Fine-tune a schedule simply by dragging and dropping individual operation steps on the “view schedule” screen. Schedule conflicts are avoided since activities are monitored in real time to ensure that all applicable constraints are met before schedule changes are saved.